Douglas Robert Zachariah Brien was born November 24, 1970 in Bloomfield. Solidly built with great coordination and strong legs, Doug was a standout in youth soccer. After his family moved to Northern California, Doug starred for the Del La Salle High football and soccer teams in Concord, a suburb of San Francisco. A bright student with a two-sport pedigree, he attended Berkeley on a football scholarship, where he smashed the school’s career placekicking records and earned a degree in Political Economy of Industrial Societies. Cal was a bowl-quality team in each of Doug’s four varsity seasons. The Bears won the 1991 Citrus Bowl in Doug’s freshman year and the inaugural Alamo Bowl in his final game as a senior. In all, Doug hit on 56 of his 80 field goal attempts and left Cal with the school scoring record of 288 points. 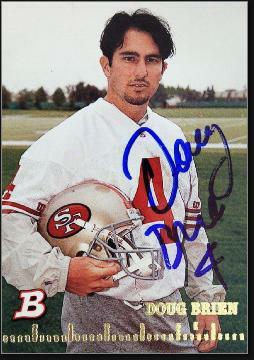 In 1994, the San Francisco 49ers took him in the third round—a very high pick for a place kicker. Doug was the 49ers’ regular kicker in 1994, leading the NFL with 60 extra points as San Francisco went on to win Super Bowl XXIX against the Chargers. It was actually the second time the two teams had played that season. In their first meeting, Doug used his soccer skills to save a touchdown when he made a slide tackle to prevent a touchdown by Andre Coleman. Doug also made a memorable play in the NFC title game against the Cowboys when he recovered a fumble by kick returner Kevin Williams. The 49ers scored soon after to forge an insurmountable 21–0 lead. Doug’s 17 postseason XP’s set a new league record. Doug lost his job to Jeff Wilkins the following season and was signed by the New Orleans Saints. He kicked for the Saints through 2000 and earned a masters degree from Tulane during his years with the team. Doug established himself as one of the NFL’s most accurate kickers, consistently making 80 to 80 percent of his field goals. Doug bounced around the league for a couple of seasons before landing with the Jets in 2003 and 2004. In 2003, he missed just one field goal inside of 50 yards and was perfect on extra points. He was nearly as good in 2004, but Jets fans are still steaming about his final kick of the year, in the playoffs against the 15–1 Pittsburgh Steelers. The underdog Jets were in position to pull of a huge upset with the score tied 17–17 and less than three minutes to play. Doug attempted a 47-yard field goal which went right down the middle but hit the cross bar and bounced back on the field. Incredibly, the Jets got the ball back on an interception and Doug had a second chance to win the game, this time from 43 yards. He hooked it badly to the left. The Steelers won 20–17 in overtime. Doug was released and played part of the 2005 season with the Bears before calling it a career. He retired with 915 points in the regular season and another 47 in postseason play. His 80.2% accuracy on field goals still ranks among the best all-time marks. Although not known for distance, he hit on more than half of his attempts of 50 yards or more. After football, Doug started a real estate company in the Bay Area that amassed more than $3 billion in assets.